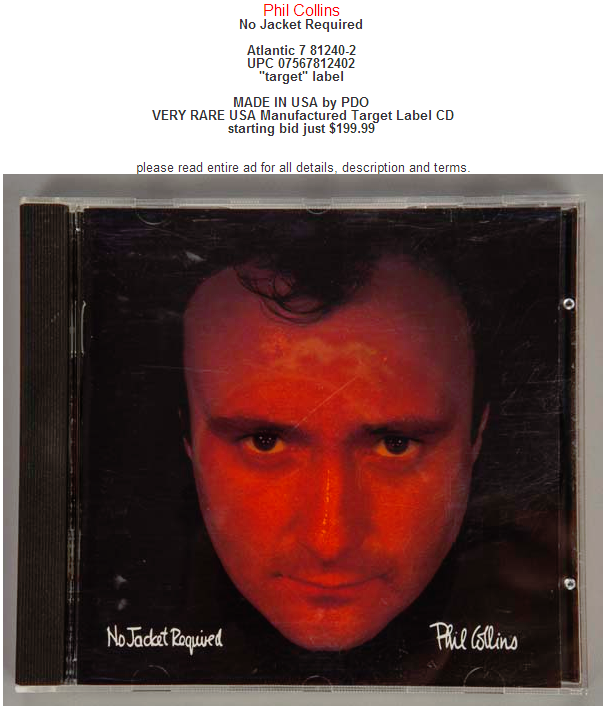 Some time ago my heart began to beat a bit faster when I noticed an auction for a very rare variation of the Phil Collins CD, No Jacket Required, which I had never seen before. 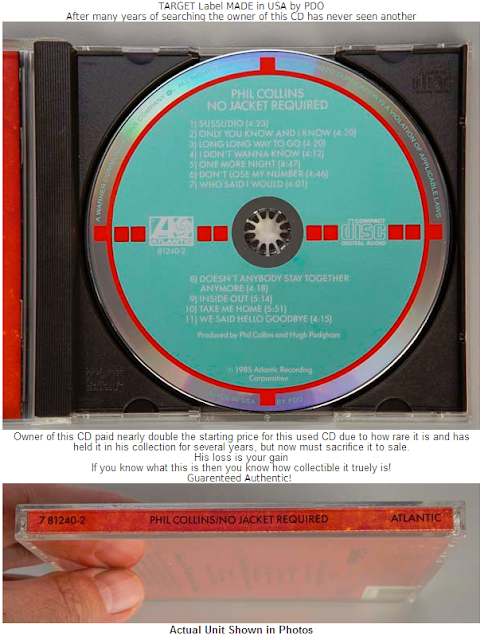 The CD that was put up for sale had the text MADE IN USA BY PDO in stead of the common MADE IN WEST GERMANY BY POLYGRAM printed at the bottom. The auction was entered by proshootercom which is the eBay alias of proshooter John Lacy who tries to make a living running a photography shop in the neighborhood of Detroit, MI. You can understand that after the auction ended I was delighted to find out that I had placed the winning bid. In fact, apparently my bid had been the only one. The total amount of the invoice was $272.46 ($199.99 (item price) + $3.00 (shipping) + $52.54 (customs services) + $16.93 (international tracking)). After it was paid, I impatiently waited for the CD to arrive. It arrived today, but when I opened the jewel case I could not believe what I saw: it was a common variation of No Jacket Required, MADE IN WEST GERMANY BY POLYGRAM of which you can find as many copies on the internet as you like. I contacted the seller telling him that the CD that he sent me did not state MADE IN USA BY PDO as he had announced in his auction but simply said MADE IN WEST GERMANY BY POLYGRAM. I also argued that this variation was completely useless to me and had no value for me as a collector. Lacy disputed the claim that I had filed telling me that his ad described the condition accurately and that the disc plays cleanly. Of course he completely ignored the fact that the CD he sent me was not the CD he advertised but a cheap variation that everyone can find for less than $10. He also made it clear to me that in any case the amount I had paid for customs services ($52.54) and for international tracking ($16.93) was not refunded in case I returned the CD. He furthermore warned me that he would file a claim if the CD I returned was not the same as the one he had advertised. After I escalated my claim to Customer Support, I was very disappointed to find out that eBay decided the case in favor of the seller. When I demanded an explanation for this they said they had decided not to refund me, because I so-called didn't want to return the CD, which of course is not true. I did want to return the CD, but I wanted a full refund and not a partial one. Moreover, the negative feedback "Swindle! The CD I received is MADE IN WEST GERMANY BY POLYGRAM and not MADE IN USA BY PDO!" that I left for this transaction was also removed by eBay, which makes them complicit in this cowardly theft. I did not hesitate for one second and contacted eBay again with the demand to close down my account immediately. I will not purchase from an online site that supports and sustains shameless swindlers such as proshootercom to carry out their fraudulent scams. I talked to my friend Al about this dreadful business a number of times during the past few days. When he suggested that I should issue a permanent warning to all guileless buyers who get swindled by criminal crooks using online sites to advertise collector's items but in stead deliver their worthless crap at expensive prices, I had to think of the Roman senator and soldier Cato the Elder. It was indeed Cato who warned his fellow citizens for the dangers that the city of Carthage posed to the security of Rome. And no matter what he was talking about, be it the price of rice, the color of money, la vie d'Adèle, ..., he always ended his speech with the phrase Ceterum censeo Carthaginem esse delendam (Furthermore, I consider that Carthage must be destroyed). Eventually at the end of the war that is now known as the Third Punic War, Carthage was completely destroyed and Cato could finally rest in peace.